» ARTHUR CONAN DOYLE: The Lost Special (Revisited). ARTHUR CONAN DOYLE: The Lost Special (Revisited). None of the Round The Fire Stories features Mr. Sherlock Holmes, although two mention anonymous letters to the press presenting solutions which some readers believe to have penned by the great detective himself (“The Man With the Watches” and “The Lost Special”). “… and then we have “The Lost Special,” in which we learn of a letter: “… which appeared in the Times, over the signature of an amateur reasoner of some celebrity at that date, attempted to deal with the matter in a critical and semi-scientific manner. An extract must suffice, although the curious can see the whole letter in the issue of the 3rd of July. A clue to the answer, I believe, is that in both cases the unnamed letter writer was wrong. In “The Lost Special,” the train had been driven onto one of the four side lines of which it was earlier remarked that they “may be eliminated from our inquiry, for, to prevent possible accidents, the rails nearest to the main line have been taken up, and there is no longer any connection.” The villains had temporarily relaid the missing rails. In “The Man With The Watches,” nobody jumped from one train to another. The dead man had been in the Euston to Manchester express all along, but had removed his disguise before his accidental killing, which occurred when his criminal associate attempted to shoot a third man who had joined them in their compartment but missed. My apologies to Mr. Gould for not pointing out this very useful reply until now. My only excuse is that I was out of town attending the Bordentown pulp and paperback show around the time his comment was posted, and I suspect that in the rush to catch up when I was back here at home, I simply failed to. But here’s what I discovered that prompted my attention back to “The Lost Special” again, a rare find: one the “missing” episodes of Suspense, one of Old Time Radio’s best-known, and longest-lasting mystery programs. 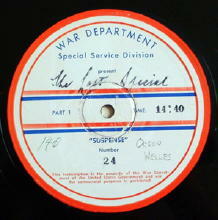 Unheard publicly since September 30, 1943, we bring you Orson Welles starring in “The Lost Special” a “tale well calculated to keep in you Suspense!.” Originally broadcast on the CBS radio network, but now lost, the version heard here was distributed by the Armed Forces Radio Service as program 24 in the Suspense series. “The Lost Special” is based on a Sir Arthur Conan Doyle story and concerns a train that mysteriously disappears. The story was also used on the series Escape on February 12, 1949, so it may seem familiar. (You can give it a listen here.) However, in the “Suspense” version, the story is told by the main character and framed as a broadcast by a condemned man that will reveal the identity of persons responsible for certain crimes. Orson Welles appeared in the series Suspense eight times between 1942 and 1944 in such classics as “The Hitchhiker” and “Donovan’s Brain.” One of Welles’ performances, “The Lost Special,” was thought to be one of about thirty-five Suspense programs missing out of over 900 broadcast during the run of the series. Go visit, listen, and enjoy! On reflection vis a vis the matter of the missing rails in The Last Special, is it beyond possibility the master mind behind the crime is Professor Moriarty, that Napoleon of crime, whose widespread network of criminals could no doubt produce enough men to form the gang of gandy dancers needed to restore the missing rails? According to The Valley of Fear Moriarty had a younger brother who was a station master in the west of England so there’s a connection (no pun intended) to the railways right in the family — not to mention both this story and The Man With The Watches are based on incidents featuring trains. As for the letters, if the man behind both events is in fact Moriarty, what a temptation for him to send them with hints showing they were written by his arch enemy Holmes, both taunting Holmes and advancing theories that were mistaken. Imagine the grinding of teeth at 221B Baker Street when Holmes read them! Wasn’t “The Lost Special” filmed as an episode of the HART TO HART TV series — without any acknowledgment of Conan Doyle’s authorship or story? It could have happened, but doing a quick run through the plot summaries, I found only one Hart to Hart show that involved a train, that being “Hartland Express.” In that one, Jonathan and Jennifer find a body on a train while they’re traveling from Chicago to Los Angeles. Of course, the train might have been switched from some other mode of transportation — but I don’t think it would have worked very well without it being a railroad puzzle — or could it have been another series, like McMillan and Wife, maybe? Yes, indeed, Mary, that adds a devilishly intriguing twist to the hypothesis. In the light of a remark that Holmes made to Watson in connection with the Retired Colourman, I am tempted to ask you, Mary, if I may: are you a chess player? If you read-listen-watch between the lines, you realize both the TV serial “Lost” and the graphic novel “Watchmen” were based on “The Lost Special” and on its previous adaptations and the real-life event that probably inspired the original: the loss of Engine 115 into a sink hole in mining country on Sept. 22, 1892 in Lindal, England. Several of the other stories in “Tales of Terror and Mystery” were also referenced slyly by “Lost”.